【7 Custom Preset Modes】 The air fryer has 7 presets featuring: fries/chips, chicken, steak, shrimp, pork, cake, and fish, versatile for most of dishes. You can choose from 7 touch presets or set your own Time and Temperature. No need to be a professional chef. Smart presetting buttons is amazingly fast and easy for you to prepare a meal by press one button. 【Heat Preservation and Memory Function】120-minute heat preservation function allows you to enjoy hot food at any time. The machine will automatically power off when the fry pot has been taken out. And there is no need to reset the temperature and time again with memory function. 【Digital Touchscreen + Knob Control】Compared with the similar pieces on the market, Habor xl air fryer innovatively achieves the 2-in-1 operation by combining the intuitive LCD touchscreen control with PUSH knob. Make it convenient for you to adjust temp&time by rotate the knob. 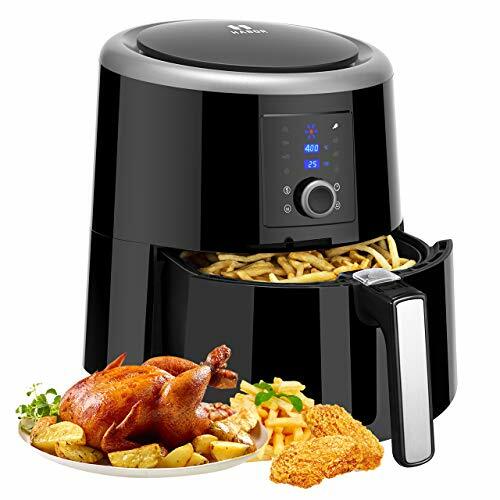 【5.8QT Family-size Capacity】50% more capacity than other similar air fryers, Habor air fryer with 5.8QT fry basket capacity gains a competitive advantage over rival products. It can handle mealtime for the whole family of 5-8 people in a short time. 【Safe to Use & Free Recipes】Non-stick fry basket and removable parts are dishwasher safe and easy to clean. Heat dissipation technology ensures more efficient and safer use. A detailed recipe book is provided to help you discover 100 ways of frying, baking, grilling and roasting. Habor oil less air fryer provides 3 years WARRANTY and 24/7 customer services, 100% Risk Free! If you have any questions about this product by Habor, contact us by completing and submitting the form below. If you are looking for a specif part number, please include it with your message.